Thousands of species of birds are known to live throughout the world. Some make their home in aeries high in the mountains; many others fly from tree to tree in temperate or tropical forests; and still others glide above shifting desert sand dunes. Then there are the birds, such as ostriches and penguins, that do not fly but instead run across land or swim in the oceans. 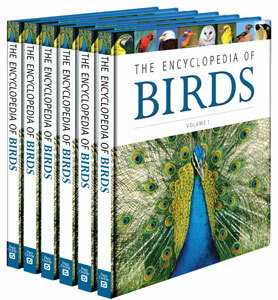 The Encyclopedia of Birds details various aspects of these amazing creatures' lives and provides insight into humans' fascination, and complicated relationship, with birds of all kinds. This full-color, six-volume set presents a comprehensive look at the world's most interesting birds, showing their extreme diversity as well as common features including wings, feathers, and hollow bones. Highly illustrated with more than 1,200 full-color photographs of birds in the wild and outstanding diagrams, this valuable reference offers concise, clearly organized information on birds, including physical features, diet, distribution, behavior, habitat, and more. A useful resource for students, researchers, and bird lovers alike, The Encyclopedia of Birds helps readers understand and appreciate these important, and in some cases endangered, life-forms. "...useful for arousing or encouraging interest in the world’s birds...attractive and readable..."
"Designed for young readers, this set will be enjoyed by bird lovers of all ages...special features...help bring a special liveliness to the articles...will be welcome in both school and public libraries, both for report material and for the general reader who wants to learn more about birds. Recommended." "...an excellent, comprehensive reference for a range of libraries...The blend of striking, lovely color photos and drawings and detailed natural history make it an exceptional student reference." "Both browsers and budding ornithologists will enjoy learning about some intriguing creatures..."
"This valuable reference for students and browsers alike provides clear and concise information in an appealing layout...student-friendly." "Twenty Best Bets for Student Researchers, 2008"